THE QC CHECKLIST – HOW ESSENTIAL OF A TOOL IS IT? The recommended design is in a simple Yes/No answer format (such as “Is the ARM Rider in file?”) or in an instructive format (such as “Do the terms of the ARM Rider match the terms on the ARM Disclosure?”). A well-designed checklist should aid the auditor in conducting a thorough review of QC loans, but not be the only tool used to complete the reviews. A strong QC department will have qualified QC auditors who are experienced underwriters, knowledgeable, resourceful and well-trained. 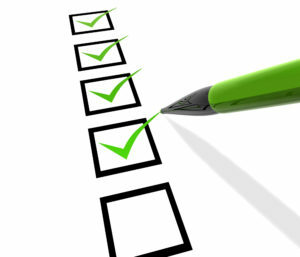 A checklist should not be used as a crutch or a substitute for knowing and understanding guidelines and requirements. In responding to their manager regarding an error found by the lender client, one QC auditor answered that there wasn’t a question on the checklist regarding that particular issue! Do not allow this to happen – checklists should be prompts or reminders and not prohibit the auditor from thinking outside the box or citing defects. The checklist should not be so lengthy as to take overly long to complete. When developing the checklist, it is best to analyze underwriting areas and documents to determine which have the highest possible number of defects and that present the highest risk. For instance, 20 questions related to a fixed rate note are not needed by an experienced QC auditor. However, even an experienced QC auditor will benefit from the line by line set of questions for the Loan Estimate and Closing Disclosure. The checklist must be continuously monitored and updated according to the most recent guidelines and requirements. More often than not a checklist is not perfect right from the beginning and it requires a lot of fine tuning. A critical component to a successful QC checklist is the comments received from the QC staff. Discussions with the QC staff will allow for the development of a checklist that meets their skill levels and ability to audit a loan in a timely manner while still delivering a quality product. What are their challenges with the checklist? What can be removed? What should be added or revised? And finally, listening to and applying the feedback from lenders who receive the QC results is vital in developing the optimal QC checklist.